1. Your learning goals should drive your tech goals, and not the other way around. Just because you have access to iPads, Chromebooks, or some other device in your classroom doesn't mean they must be the center of learning in your classroom. Not every lesson can be made better with technology. 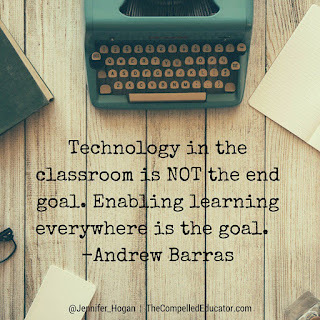 Allow your goals for learning to lead you to the most powerful ways for tech to further support those learning goals. Keep your students at the center of learning, not a device. 2. It's not enough to think tech is important for students. You must be willing to learn it yourself. To deny that tech will be important to students' futures seems unthinkable. But it's not enough to recognize students will need tech to be successful. 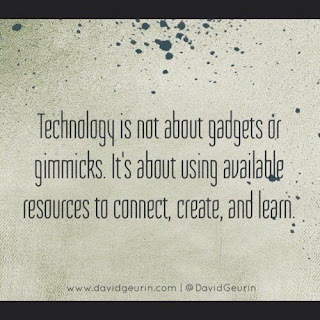 Your students also need to see you as a willing learner of technology. They need to see you as a learner period. 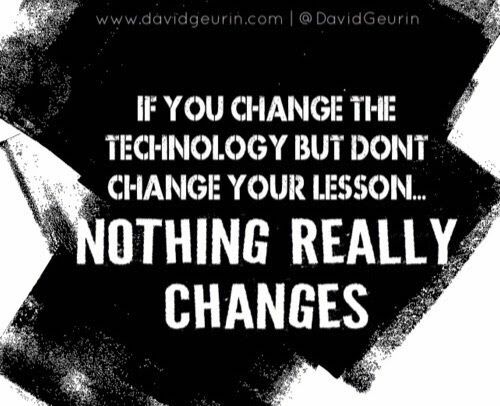 And it's a shame if you aren't leveraging your skills as a teacher because you aren't willing to learn technology. All of your teacher skills are priceless, but they can be even more relevant and powerful if you know how to effectively use technology for learning, too. 3. Tech can make kids want to learn more, but more importantly, it creates opportunities for more learning. Lots of kids like to use technology. 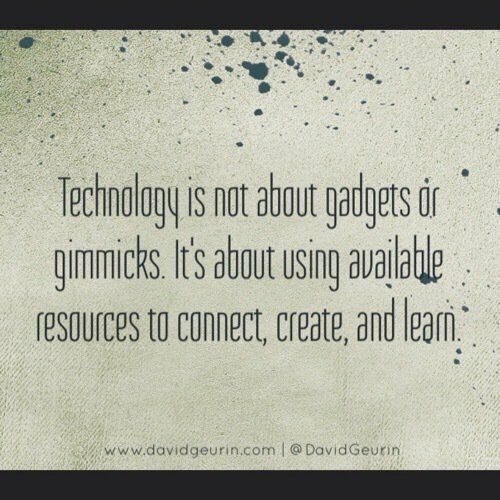 But using tech because it is engaging isn't as important as using it because your students are engaged. If your students are curious and motivated learners, they will have questions that need answers. They will want to create and share new knowledge. You know your students. You inspire them as learners and that relationship will ultimately lead to more learning. Technology can then create unlimited opportunities to create, learn, and share. 4. Being an effective learner in the modern world also means you are an effective digital learner. Readers of my blog know I believe adaptable learners will own the future. The ability to learn, to be creative, to see possibilities, to make something new, will be a huge advantage for future success. But in today's hyper-connected, digital world, being an effective learner also means you are effective in using digital tools for learning, solving problems, and creating knowledge. 5. If you change the technology but don't change your lesson, nothing really changes. 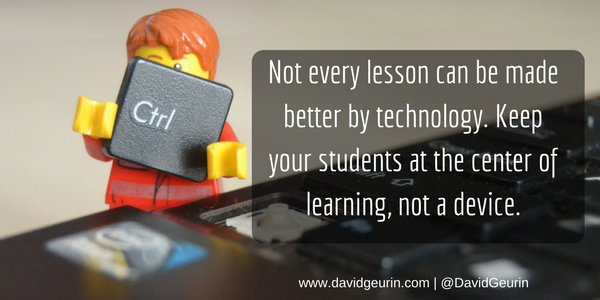 Adding technology to the same old lessons doesn't automatically make them better lessons. Work to create a better lesson first—one that is meaningful and authentic and causes deeper thinking and greater understanding—then consider how technology can make it even better. Technology won't improve learning if that worksheet is now in digital format. 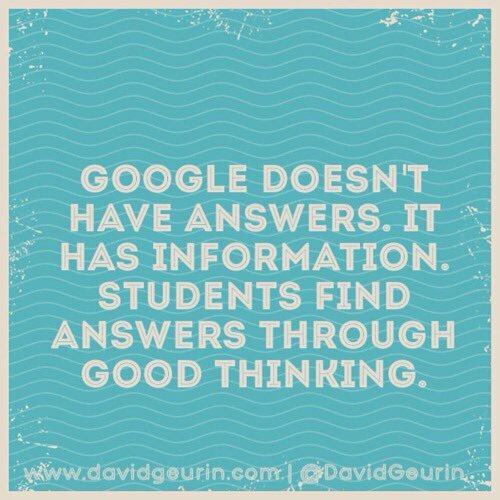 It won't inspire learning if students are just looking up answers online instead of in the textbook. Your lesson design is always more important than your digital tool. 6. For students who don't know how to use social media appropriately and effectively, who knows what opportunities they might miss? If you want to be successful, do what successful people do. And some of the most successful people in our world are using social media and blogging as a platform to network, share their message, and improve their work. How many kids have the chance to practice these skills in school? As digital footprints replace traditional resumes, will your students have anything to show for their work? Even worse, will their digital record disqualify them to employers? 7. Google doesn't have answers; it has information. 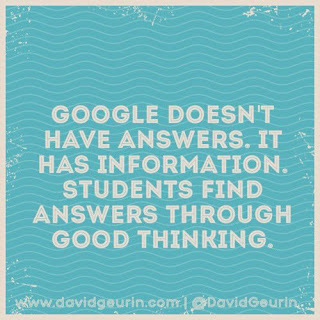 Learning and inquiry involves more than searching for right answers. Students make meaning of information through good thinking. The most interesting questions don't have one right answer and require students to think in ways that lead to understanding. Access to a web-connected device is a powerful tool for learning. It creates agency, empowers learning, and puts students in the driver's seat, but only if we allow it, support it, and facilitate it. 8. Tech should make us more human, not less. It's not hard to see ways technology is both a blessing and a burden. So we need to be thoughtful about how we use technology for good and limit the negatives. We've heard a lot about how social skills are deteriorating as a result of attachment to mobile tech and addiction to device notifications and so forth. But technology can help us connect, do more good, and be more human, not less. In the classroom, technology should lead to more conversations, not less. Students are going to use technology. We need to help them use it in ways that are healthy and productive. 9. Anyone who wants to be a leader needs to be a digital leader too. We are past the days where leaders could just count on the tech department or that one teacher to take the lead on technology. Every person who aspires to lead should expect to be a digital leader too. Leaders don't have to have better digital skills than anyone else, but they do need to model the use of technology and constantly be willing to learn. Working to stay informed, learning new tools, and being future-driven are critical to digital leadership. And every leader should strive to be a digital leader too. Question: What essential #EdTech idea would you add to this list? I want to hear from you. Leave a comment below or respond on Facebook or Twitter.